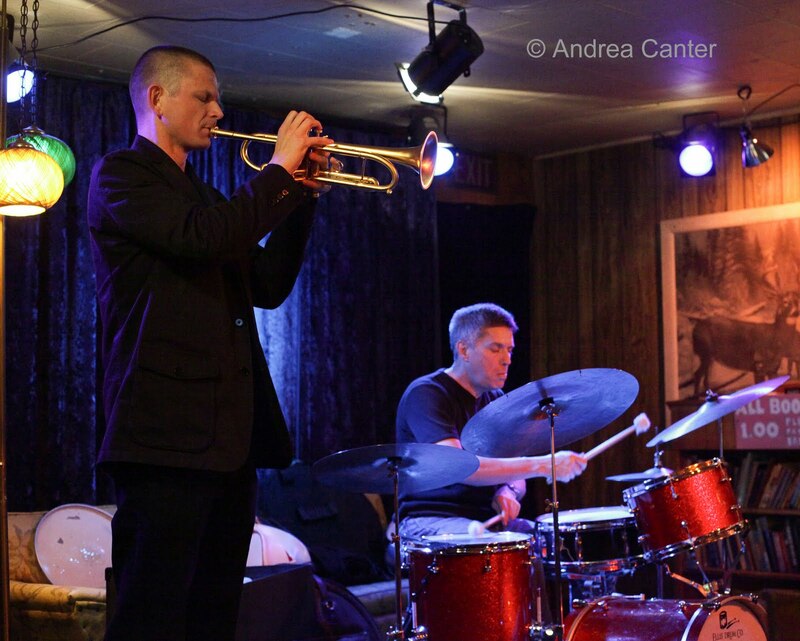 Only two nights apart, some of the finest in spontaneous improvisation took place in two of the smallest, but maybe most appropriate, music spaces in the Twin Cities. With one common denominator (drummer Phil Hey), the two ensembles proved that “free jazz” is alive and well, and that it’s far more than rhythmic noise. 5/1, Lease/Moriarty Quartet. 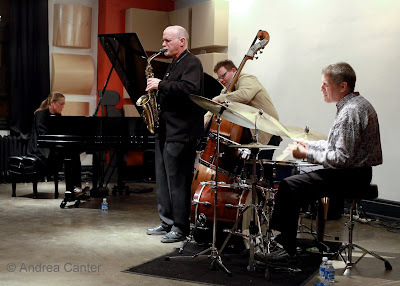 Saturday night was the last installment of the “Tonight at Noon” season at Studio Z in St. Paul’s Lowertown, a series of modern improvisation hosted by jazz and life partners Ellen Lease and Pat Moriarty. The piano/sax couple have long led the Lease/Moriarty Quintet, and for the past six months or so, have brought guest musicians to join them in some freewheeling creations. This weekend, the musical chefs included bassist Adam Linz and drummer Phil Hey, no strangers to spontaneous improvisation and composition. Linz plays most visibly with Fat Kid Wednesdays, locally, in New York and abroad, and lends his top-to-bottom explorations of the upright bass to a variety of settings, from solo to large chamber groups. Hey, in addition to his own quartet, mans the trapset for the Out to Lunch Quintet, going beyond Dolphy, and released a duo recording of improvisations with trumpeter and former local hero, Kelly Rossum. With no planning, no pre-conceived ideas, this was akin to watching musicians create in a transparent skin, looking into the heart and brain to watch as well as listen to synapses forming and firing, ideas passing from one to another and back again. The one horn (Pat’s alto sax) was the only instrument to be used in a traditional manner—piano, bass and drums were each subjected to a variety of percussive experiments—from the scrapes of sticks and pounding of palms on the drums to the batting of the bow against the top of the bass and across strings below the bridge to Ellen’s transforming the inner strings of the piano into a quasi-vibraphone, using small mallets to elicit hollow twangs. Where was the video camera? And it’s not that Pat blew mainstream tones from the sax, to the contrary. Sometimes it was like a train whistle, a bird, a flock of birds, a chorus of trains. When focused on the keyboard itself, Ellen pummeled with her fists one minute and suggested Crispell-like ice crystals the next. Each voice had its say in its time, invisibly signaling another voice to step in and redirect the music. As in the old Twilight Zone serial, we were transported beyond the normal range of sight and sound to another dimension. It was haunting, often beautifully melodic and dangerously thought-provoking. It was a perfect storm of improvisation. 5/3, Rossum & Hey. Speaking of Kelly Rossum, he was back in Minnesota, performing Friday and Sunday with the jazz bands at St. Olaf. He had just enough time to come down to the Clown Lounge below the Turf Club in St. Paul’s Midway neighborhood to combust with Hey for one late-night set, reprising their recording, Conflict, released last summer. “Conflict” refers to the tension between trumpet and drums, a yin and yang, push and pull among two mortal friends. The pair dueled over three segments for about 45 minutes, pausing briefly between skirmishes to reload. The resulting music featured simultaneous plots as well as intense soloing: Rossum in full command of his horn’s many hidden voices, those that sing, those that squeal, those that whine with snakey elegance only to rehydrate as rusty hinges creaking in the dark; Hey covering every surface of the trapset with sticks, mallets and bare hands, from barely audible hints of power to full-blown explosions that make you dive for cover. I only recognized snatches of “Pure Imagination” and suspect the rest also originated in the material on Conflict, but no matter, the set in full was pure imagination.